The Lakeland Lightning kick back after crushing all contenders in Kelowna, B.C. on May 8. 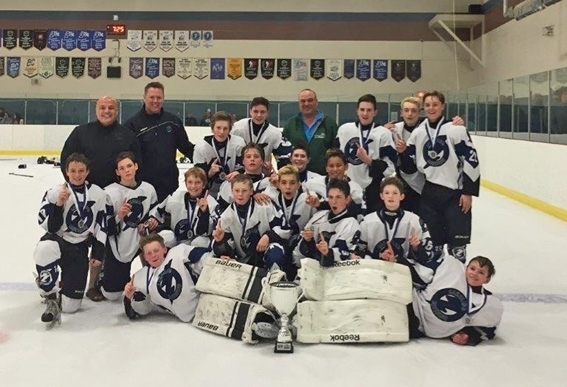 The Lakeland Lightning has surpassed all expectations at the 2016 Canada Cup West in Kelowna, B.C. on May 8. The AAA peewee team drew players from AA teams in Bonnyville, Cold Lake, Lloydminster, Fort McMurray, Mallaig, Kitscoty, Wainwright and Vermilion. Swan explained that the majority of the players on the team had previously played in the Alberta Winter Games. The team opened the tournament with a scorching 6-0 victory over the Vancouver Island Monarchs and topped it off with a 2-1 win over the Young Guns Elite Hockey Academy. The Lightning then clobbered the Calgary Riggers 7-1 and plundered the Kamloops Ice Pirates 5-2 to finish the round robin with a perfect 4-0 record. The Lightning continued zapping their competition on all fronts, defeating the Chilliwack Jr. Chiefs 5-2 in the semifinal before taking the gold in a thunderous 4-2 victory over the Grande Prairie Storm. This is the first level of hockey where players are able to engage in full contact. Bonnyville contributed five players to the dream team. All local players were scouted from the Lakeland Peewee AA Panthers. The team began practicing for the tournament during the weekends at the end of April. The team will have two more practices until heading off to Saskatoon for a second tournament that starts May 20. “We're focusing on training and habits. All the good stuff,” mentioned Swan. Swan added he is looking forward to seeing his players develop and had a number of players earmarked as possible future Jr. A Pontiacs.